YG revealed the fourth content from their channel YG STAGE (www.ygstage.com), their subsidiary for actors and actresses, sharing new planned contents and news. YG and LVMH Group had revealed their partnership in the pats. Much curiosity was raised when teasers were uploaded recently as to who were the actors that took part of the project, making the public have high expectations. Finally, questions were answered. YG representatives of siblings chemistry, Sandara Park and Kang Seungyoon, have met up again for this project, showing a new look. 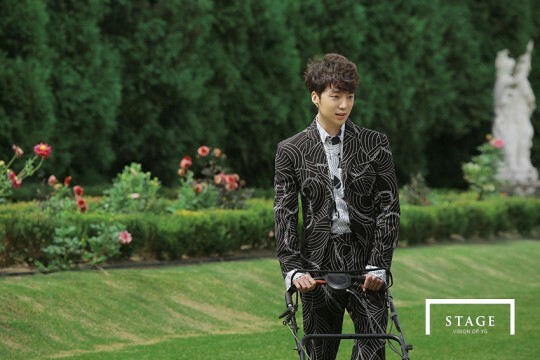 This was YG STAGE’s first collaboration project with LVMH project, the photoshoot showed the charming visuals of Sandara Park and Kang Seungyoon in a couple shoot. They revealed the dream-like atmosphere and stunning visuals that will surely delight the viewers. With the title, PYGMALION, the photoshoot started happily, showing a beautiful and sophisticated atmosphere, with the two actors harmonizing with each other and with luxurious background showing off lush nature and various classical statues. Wearing clothes form the 16FW collection with striking graphic patterns, Kang Seungyoon steps up to the camera first. The shoot starts with him releasing tension with a cute expression on his face, making the people on the set laugh. Kang Seungyoon who takes several poses in front of statues, makes every shot come alive with his bold pose and expression. Kang Seungyoon’s force in the pictorial is the same one he shows when he’s on stage, showing an atmosphere of a man exploding with charms, his stylishness harmonizes with the colorful patterns of his clothing and his chic expressions. After Kang Seungyoon’s solo shots have finished, it’s time for Sandara Park to take her solo pictures. Before coming before the camera, Sandara Park seems to have formed a concept while waiting. Facing the camera, everyone seems to wait with bated breaths as her presence commands that everyone watch. Sandara Park shows an amazing amount of concentration. Showing a beautiful and powerful charisma during the shoot, Sandara Park takes a cute selca when a break in the shooting was cute, showing an adorable expression to the fans. Although it was a filming was difficult, because of Sandara Park’s happy demeanor and friendly expression, the atmosphere was harmonious and fun. Sandara Park who showed her charming eyes to the camera, also revealed a different image and charm that makes the heart of those watching flutter. While being photographed in front of a pond, she gave off a pure and elegant charm that brought out the protective instinct of everyone. Finally, the couple shots that everyone was waiting for! They have acted together in the past and knew each other well, so they gave off a friendly atmosphere and were in-synch with each other. And because they were at ease and were eager and tireless in trying out various concepts, the photographer was able to do his job happily and the photoshoot went on smoothly. Oh Jin Hyuk, who was in charge of the project’s production, wanted the two to naturally express the love between two people who are separated by disatance. They showed off an emotional chemistry of separated lovers. Because of the two actors captivating charm and attention to detail, beautiful results were able to come out, as the photographer alternately worked with a film camera and a digital camera. Like mythological heroes who were not able to fulfill their love, but were able to express their affections and sentiments, the on-site staff who quietly held their breath as they all watched this unfold to the final cut. Will they be able to fulfill their love as expected? Even if they are not told, but these two actors who are in synch as they look at the same direction, have the same expression, and even the same gestures! Because of their perfect synchonization and harmony, the photoshoot left a good impression. As they put on different clothes, the two actors completed a couple look that was lovely to look at. The general manager of the brand visited Asia and was impressed with the filming results, saying it exceeded expectations. When the two actors realized that it was the final cut already, they laughed vibrantly, showing their light rapport. Because of the bright atmosphere of the two actors, the filming finished with a happy atmosphere. With this joint project of two companies that both have a strong unique sense and high capabilities, the expectations of their collaboration are high. With the excellent creativity from YG and the clothing brand, along with the two actors who showed their charms well, the outcome of the filming went over and beyond the expectations. Beautiful.. I really love how they went about with the shoot.. The location is lovely, Dara and Seungyoon’s chemistry is no joke..
SANDARA PARK and KANG SEUNGYOON stepped up as heroine and hero for YG’s monumental pictorial shoot. On the evening of the 27th, SANDARA and KANG SEUNGYOON made a surprise reveal of their photo shoot by posting a video of them at the shoot via ‘LIVESTORY’ featuring of ‘SNOW’, a communication app. In the video, the two show their fun and mischevous sides, filling the clip with their explosive wits, and lead the shoot on a happy vibe. However, the two became more serious than ever as the actual shoot began. The glimpses of their chic and lofty shoot, which can be seen in the behind the scenes clip, only heighten the excitement for the pictorial. Previously on the 26th, YG has gathered much attention as it revealed its first collaboration project with LVMH. The teaser images released at the time concealed the identity of the models and merely showed parts of their body, intriguing the public. This project photo shoot features the 2016 F/W collection of ‘KENZO,’ a fashion brnad owned by LVMH. For the photoshoot, KENZO itself has flew in collection samples that are not available in Korea, from various countries including France and Singapore. From the internationally reknowned photographer Ok Jinhyuk, to the creative team, cinematography, hair, makeup, to styling, some of the best hands in the entertainment business came together for the photo shoot. “PYGMALION” is a sculptor in Greek mythology who falls in love with his own sculpture. In pyschology, the phenomenon whereby higher expectations lead to performance is called the “Pygmalion Effect,” after the mythological figure. Check out the teasers after the cut!